The plastic surgery procedure to correct saggy eyelids is called a Blepharoplasty. This operation is known for giving people a more youthful and rested look by removing the excess skin and fat around the eyes. This operation may be performed on the upper eyelids and lower eyelids separately, at the same time, or in conjunction with another procedure (face lift or brow lift). You must realize it is impossible to repair every wrinkle and remove every line around the eye, but this surgery can be one of the most gratifying procedures a patient can have. 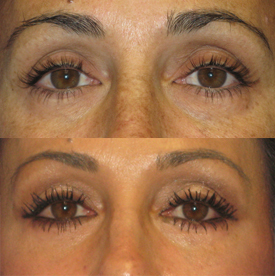 The incisions for blepharoplasty are made after an anesthetic is injected into the eyelid area. The incisions are placed in the natural crease of the eye for the upper blepharoplasty and just below the lower lashes for a lower blepharoplasty. 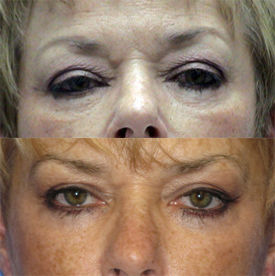 In certain cases, a lower eyelid blepharoplasty may be performed without a skin incision, the so-called Transconjunctival Blepharoplasty. 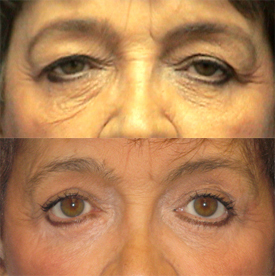 Most lower blepharoplasties require blending of the eyelid/cheek skin and addressing the "tear trough" deformity. The transconjunctival blepharoplasty is reserved for those people with normal skin, no significant skin sagging, and only fat bags requiring removal. An incision is made inside the lower eyelid on the conjunctiva to gain access to the fat bags only. Although this relatively new procedure may obviate the need to remove sutures and give a scar-less result, the recovery period, swelling, and discoloration may be similar to the "routine" blepharoplasty with skin incisions. 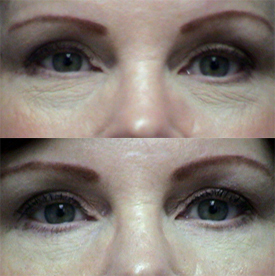 There are many patients who require a browlift instead of upper eyelid surgery or in conjunction with eyelid surgery. 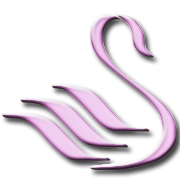 It is important to consider to appropriate procedures to best achieve the desired results. I see too many patients who have previously had upper eyelid surgery without consideration of the later desired brow lift making it not reasonable if the upper eyelid surgery was performed also without this consideration causing too much skin to be removed. During my consultation process, photos will be taken so we may better be able to discuss your goals and the correct surgical procedure for you to achieve your desired results. As a real board certified plastic surgeon, I am trained and credentialed to offer you the different variations of eyelid surgery as well as endoscopic browlift surgery in order to achieve the most ideal eyelid surgical results. There are literally hundreds of companies developing, manufacturing, and selling laser systems to treat a wide variety of ailments. Some of these laser platforms actually work, but for the most part they never live-up to the expectations created by their marketing campaigns. There are many companies that sell the exact same technology as others but offer new “bells and whistles” as well as more attractive packaging. Doctors have a bewildering number of choices with conflicting claims of “remarkable” results. Complicating the marketplace even further is that the companies market their laser and other “do-dads” directly to the patient hoping that patient inquiries to their doctors will drive the marketplace rather than scientific studies which determine the efficacy of a specific laser treatment. Read More . . .